Cross-body and Shoulder Mini Skirt Bags Size S Hand Woven and Botanical Dyed Cotton Brown Color Code : B0093LS-CJL Color : Brown Bag size Width : 11 Inches. / 27.5 cm. Height : 7.5 Inches. / 18.5 cm. Cross-Body Bags Style Strap size Length : 45 Inches. / 112.5 cm. Shoulder Bags Style Strap size Length : 26 Inches. / 65 cm. https://s-media-cache-ak0.pinimg.com/originals/e7/ee/01/e7ee01dbb1fc42ceaf55c1b9ac1069d6.jpg https://s-media-cache-ak0.pinimg.com/originals/cd/e1/51/cde151842d73fa45604b3288baab6d7b.jpg https://s-media-cache-ak0.pinimg.com/originals/02/17/b4/0217b4d82df7d3b8268dd400c334458a.jpg A bag with two shoulder straps. Both can sling Shoulder Cross-body and perfect for any occasion. 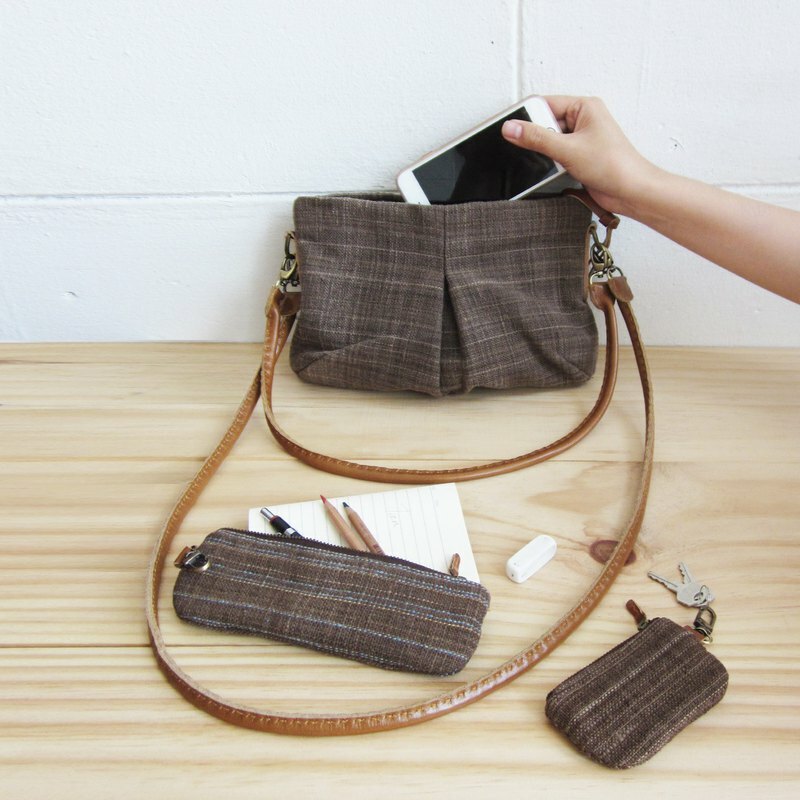 The bag consists of 100% cotton and brown leather. The hook and loop a metal brass color. In the case of a slot, and smart phones. The bag is made of cotton by Chiang Mai housewife with expertise in the field of weaving in particular. Fiber dyeing with plants native to the north of the country. Brown color is made from ebony. Ebony or Makluea (Diospyros mollis) Ma Kluea or Ba Kluea in northern dialect is normally used as traditional medicine. And, it also is used in fabric industry as dye. To produced dye, Ma Kluea fruit is fermented and bring the liquid from fermentation to filtered. The final color of fermented Makluea liquid is brown. We choose good quality cotton dyed through and clean lines with delicate. For the casual user And featured with beautiful colors. And attention to the environment and people by avoiding toxic ingredients or steps that need. Our products are safe and environmentally friendly. How To Care For Tan's Bags ^^ https://i.pinimg.com/originals/b6/c2/ed/b6c2ed1647207735086d5af2081c3b40.jpg PS. The color of the image you see may be distorted by the fact that, depending on the visibility of the device you use.